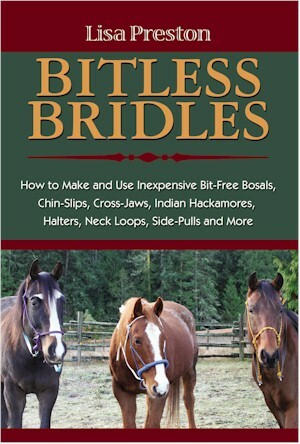 If you are wondering whether to try riding bitless, or if you have been using a bitless bridle and want to experiment with different types, this book is for you. Create a variety of reliable, custom fit bitless bridles in the colors and weights that you choose. Sizing tables enable you to fit all sizes of horses from miniature to draft. Customize and decorate your bridle to suit your taste. • The science covers the current controversy and medical findings regarding bitless bridles. • The art includes step-by-step instructions for more than a dozen different bridles, halters and other hand-made tack. • Also includes discussion on switching an already trained horse from bitted to bitless, using double reins with a bitless bridle, and how to determine whether bitless riding is right for you and your horse. Paperback, 8.5 x 11”, includes tables, color illustrations, references, sources for materials, index.